Babies (Not) on Board: The Last Prejudice? “Selfish…Neurotic…Irresponsible…Immature…Unfeminine…Unfulfilling…Materialistic…Uptight…Deviant” — all words I've heard to characterize my decision to not have children, a decision that unexpectedly transformed me into a target of one of society’s remaining and widely held prejudices. Babies (Not) on Board: The Last Prejudice? addresses the question of why women who choose maternal independence over child-rearing angers or offends so many people and institutions. 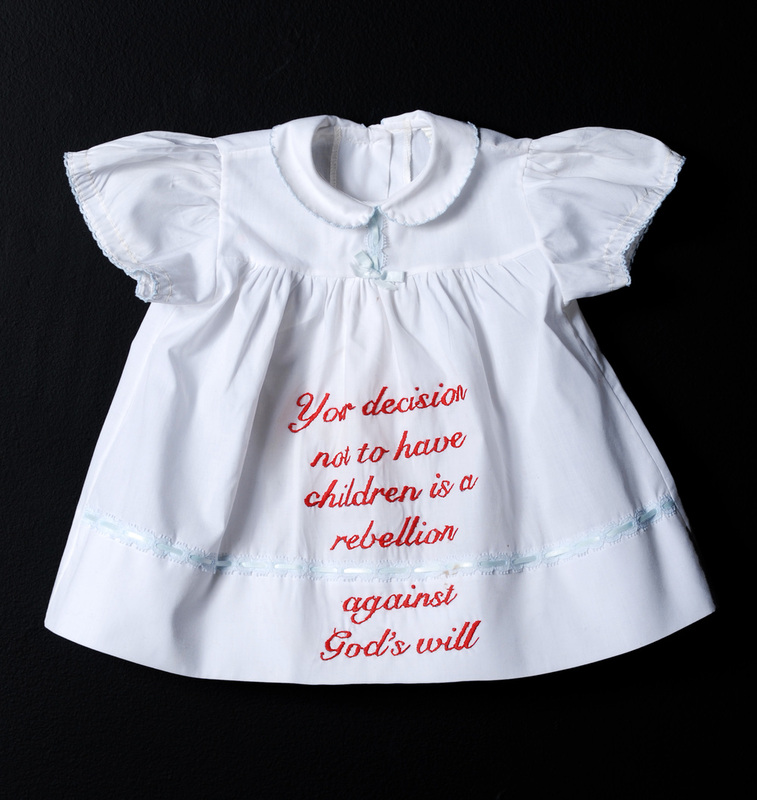 The work presented here is part of a continuing exploration of our culture’s pejorative views about women without kids. 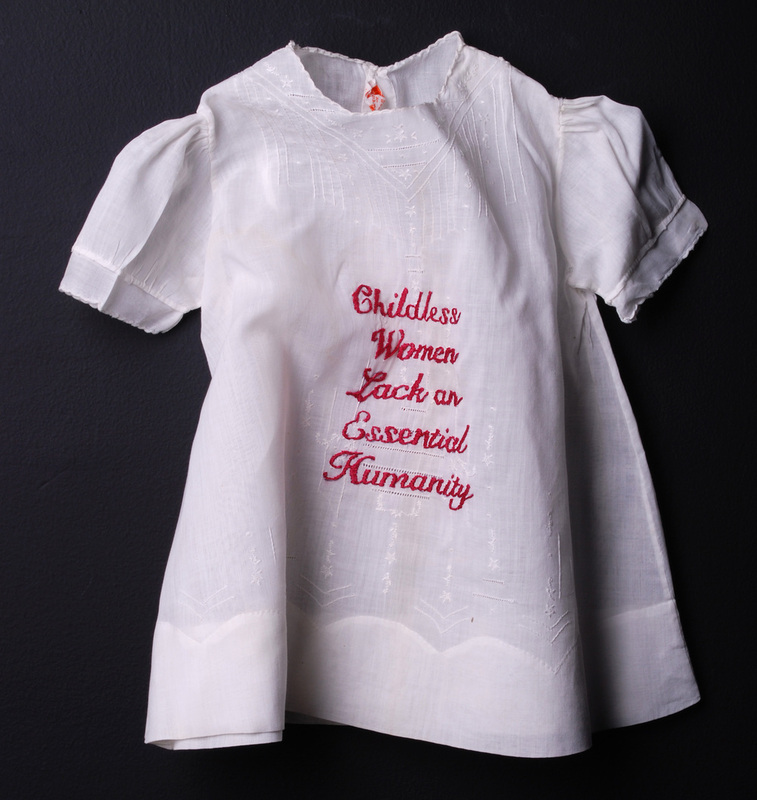 For Babies (Not) on Board: The Last Prejudice?, I hand-embroidered representative actual negative comments on baby dresses using red thread to create scarlet letters. Gathered from interviews with childless women, online research, and personal experience, the statements taunt and accuse, and are typical of an relentless flow of critical statements that seem to be growing bolder even as non-traditional families gain greater acceptance. In the course of my research, I have spoken with many women, both in formal interviews and casual conversations. Often, I chatted with women while working on the embroidery pieces, which are very portable, as I commuted to and from my teaching position at Columbia College Chicago. The responses I got were very strong. Many women, often those with children, shared with me their own stories about having felt trapped or seduced by the myth of “having it all.” Others told me about the pressures they experienced to have children before they had children, from family members and others in their communities. Lately, more gay and lesbian friends have spoken with me about the recent pressure they have felt to have children. My interlocutors raised a great many questions about the nature of the prejudice against women (rarely men) who have chosen not to (or who cannot for one reason or another) follow society’s traditional childbearing path. They also, in effect, presented the case for a better, broader understanding of this cultural bias. Does he mean having children is the only reason to have a relationship? For myself, I am clear I couldn’t have the life I live, which I love, had I children. Of course, many women manage to juggle kids, careers and other activities all at once, but many have told me about the difficulties they endured trying to do so, the importance of having resources like family to help out, and having an income sufficient to hire help. I welcome readers’ views, from all perspectives, about this prejudice as I continue my work. Please feel free to contact me with your thoughts via my contact page.